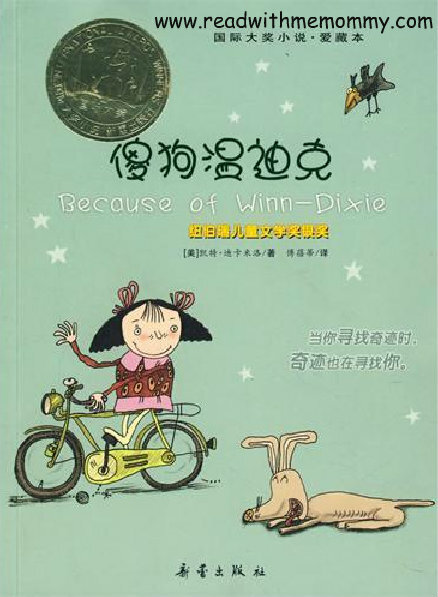 Because of Winn-Dixie is a children's novel by Kate DiCamillo published in 2000 and winner of a Newbery Honor distinction in 2001. It also won the 2000 Josette Frank Award and 2003 Mark Twain Award. Based on a 2007 online poll, the National Education Association named the book one of its "Teachers' Top 100 Books for Children.“ It has been adapted as a 2005 family film, directed by Wayne Wang, produced by Walden Media and Twentieth Century Fox. This book is the chinese translation. Soft cover. Simplified chinese. 135 pages. India Opal Buloni is a 10-year-old girl who has just moved to a trailer park in the small town of Naomi, Florida, with her itinerant preacher father. While in the Winn-Dixie supermarket, she encounters a scruffy dog wreaking havoc. She claims the dog is hers to save it from going to the pound and names it Winn-Dixie. Winn-Dixie's first act of inspiration on Opal is for her to challenge her father to name ten things about her mother, who abandoned them years before when she became an alcoholic. Opal also befriends the very wealthy librarian Miss Franny Block, who shares great stories about her past, including a tale about her great-grandfather, whose family members died while he fought for the South in the Civil War. Grief-stricken after his return from battle, he decided he wanted to live the remainder of his life filled with sweetness. Thus, he invented Littmus Lozenge candies that tasted like a combination of rootbeer and strawberry with a secret ingredient mixed in—sorrow. In Because of Winn-Dixie, these candies symbolize that even though life sometimes deals people a bit of sadness, there is always so much to appreciate. She also encounters Gloria Dump, a woman whom children think is a witch. She also meets a man named Otis. Otis is the pet shop manager in the town of Naomi. He is shy and upset because he was in jail for playing his guitar on the street, so now he plays for the pet shop animals and a parrot named Gertrude who is Otis' favorite.